You've come to the right place! Not only is there a wealth of information for photographers right here on this site, but below you'll find a list of photography ebooks too. I have personally read every book listed here and my reviews are based on my own honest opinion. I couldn't finish without a shameless plug for my own eBook package. If you own a digital SLR, this is the book for you. Written by my own fair hand, and incoporating decades of my own personal experience, this book can't be beat. Not only do you get the digital SLR guide, but you also get a full package - software guide, tips for better photos, cameras make cash...it's all in there. 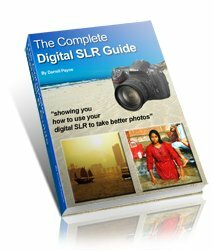 If you own a digital SLR then the complete Digital SLR Guide is for you! Why do I recommend ebooks over traditional books? They are searchable, in the same way the internet is searchable. Looking for a specific term? Type it in, and a list of pages containing that term appear right before your eyes! They also contain links to other sites of interest that are directly related to the part you're reading. This makes it an interactive experience. They are computer files and so are stored digitally on your hard drive. This means that you can't lose them. Unless you lose you computer of course! But then, you did make a backup copy of all your files, didn't you? They never wear out. It will look the same in twenty years time as it does today. And the pages won't fall out, they won't fade, and they will never get stuck together! They are printable - so if you do want a paper version you can have one. And if you set your printer setting to "draft" or "economy" mode printing out an ebook uses a surprisingly small amount of ink. So for all these reasons I would recommend an ebook over a printed book. Price wise, there isn't much in it. But for sheer flexibility they can't be beat! My son (that's him below) loves F1. He's started his own YouTube channel and would love it if you could take a look at one or two of his videos. Or, if it hurts your ears as much as it does mine, pass the link on to someone who'll really appreciate it. Content, design and layout is Copyright© 2006-2015 by Darrell Payne, digital-photography-tips.net All rights reserved. Reproduction in whole or in part in any form or medium without the express permission of digital-photography-tips.net is prohibited. Contributors to this site agree to grant an exclusive, royalty-free, irrevocable, transferable, perpetual licence to publicly display submissions on this web site and in any publication produced by this web site.